When you are on the go, and the weather is hot outside, wouldn’t it be awesome if you can drink some good bottles of ice water or other cold beverages? This is especially true when you are going for camping or picnic trip in the summer, or you are going to a sunny beach. There is nothing more pleasant and relieving than some cold drink when the temperature is boiling red. Therefore, it would be a great idea if you bring either Yeti Roadie or Yeti Hopper on your trips. These products are portable coolers that can keep your drinks cold as you are on the go. Depending on your needs and preferences, either the Roadie or the Hopper will be more suitable and convenient. So, what’s the difference? Yeti Roadie and Yeti Hopper are two different beasts. 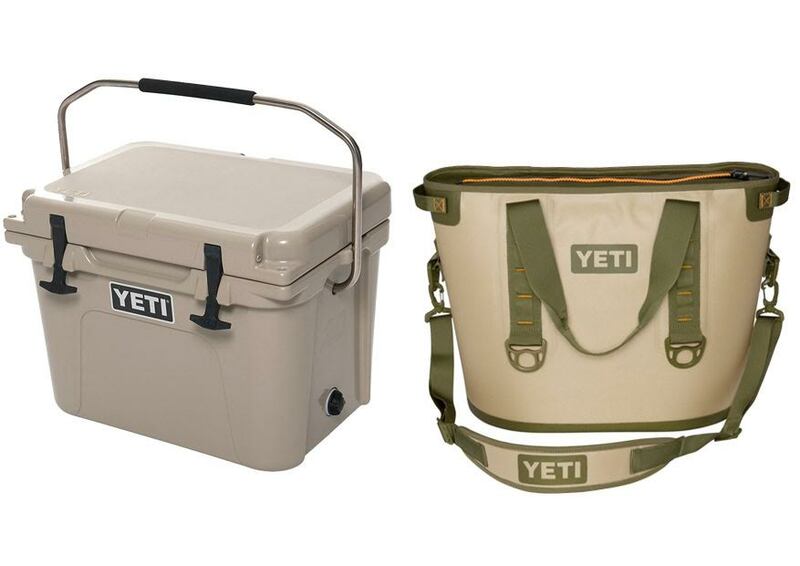 Yeti Roadie has been designed pretty much like what you would expect from a typical cooler; it is a box, available in three color variants: desert tan, ice blue, and white. It features a rotomolded construction that is ultra-rugged and ultra-durable. It is even literally “grizzly proof”. It is so robust that a bear cannot damage it. Just make sure that you lock it with an equally durable padlock, though, or it will just snap open. Such superb construction makes Yeti Roadie an ideal choice for going into the wild. By the way, Yeti Roadie is also equipped with the No Sweat Design which prevents it from sweating for mess-free storage and travel. There is a stainless steel handle for easy portability. If you love to venture by feet, you will love Yeti Hopper’s unique design. It has been designed as a bag that you can easily carry on your shoulder or back. This design is very convenient when you are traveling by walking and you have other things to be held with hands. Available in orange and blue colors, Yeti Hopper features a lightweight yet effective design with 840-denier double-side thermoplastic urethane outer layer, closed-cell foam insulation, and EVA bottom. The DryHide Shell is 100% leakproof and puncture-resistant, and the HydroLok Zipper is 100% leakproof and locking. It doesn’t sweat except on the top, on the zipper. Yeti Roadie is only available in one size, which is able to carry up to 20 lbs of ice alone or 14 cans of beer. On the other hand, Yeti Hopper is actually available in three sizes: Yeti Hopper 20 (18 cans / 20 lbs ice), Yeti Hopper 30 (24 cans / 30 lbs ice), and Yeti Hopper 40 (36 cans / 40 lbs ice). For going into the wilderness, where extreme abuse is possible, it is best to go with Yeti Roadie. Otherwise, you can choose Yeti Hopper instead, which has a nice design and bigger sizes.